What's so great about Dental Implants? The thought of losing a valuable tooth (or teeth) due to a health condition, accident or tooth decay can be quite stressful. It’s natural to be concerned about the impact it may have on your appearance and the impaired ability to chew and enjoy food. You can rest assured that our team at The Dental Lounge @ Robina has a great solution for your predicament. Let’s take a brief look at the options available for replacing missing teeth. A Bridge – it’s exactly what it says – it’s particularly useful for replacing multiple teeth in a row, fitting over the teeth on either side of the gap to create a solid connection to the jaw. Dentures – for many years dentures (false teeth) have been the solution to replace an entire arch of missing teeth. However, while both options above achieve the practical aspect of dental functionality and uniformity, they are unable to support the jawbone where the original tooth (teeth) were anchored. Over time the bone can deteriorate, weakening the area and surrounding teeth causing changes in facial contour (sunken), oral health issues and possible speech problems. 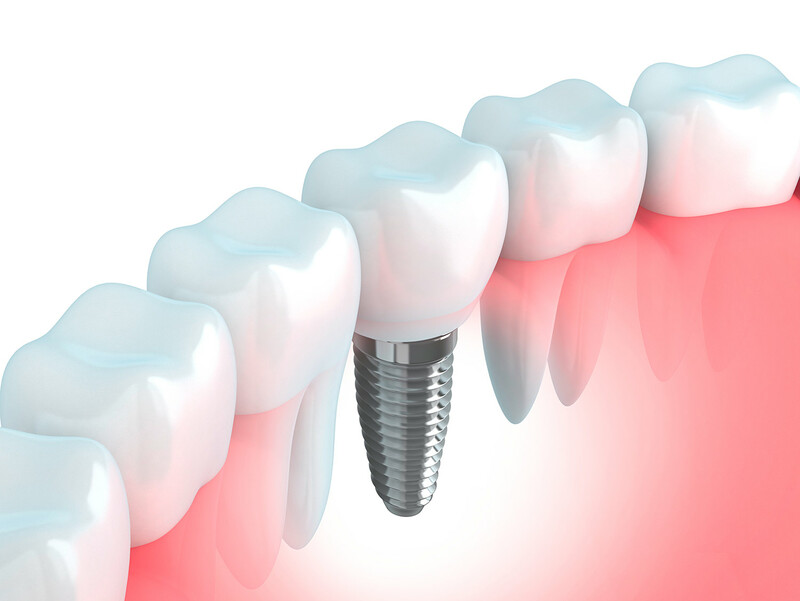 Dental Implants - are the preferred long-term option for tooth replacement. They are aesthetically designed to seamlessly blend naturally with your other teeth, provide long-term strength and stability for chewing, plus preserve bone structure. Dental implants are fitted by anchoring a medical grade titanium post (an artificial root), directly into the jaw bone at the site of the missing tooth (or teeth). A ceramic crown is then placed on top of the post, which appears and functions just like a strong healthy tooth. (Note: If you need a full set of teeth the process is slightly different whereby Implant teeth are permanently attached to several posts, but not one for each tooth. This still provides the teeth stability without causing unnecessary surgical trauma). In conclusion, whenever possible, we recommend dental implants as the best option for replacing teeth providing long-term satisfaction and durability. Dr. Mah is our resident go-to dentist for Dental Implants here at The Dental Lounge. He is passionate about using the latest technology and materials to achieve amazing results for our patients. If you are looking for the best solution to replace your missing teeth or would like to chat to our friendly staff about our dental services, please give us a call and allow us to give you the confidence to smile again! The Dental Lounge @ Robina, ph. (07) 5580 8855 or click here for location details and business hours.